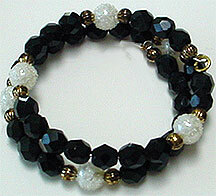 beads accented with small 3 mm crystal beads. The necklace is 15" the earrings 3/4". the necklace is 25", with gold metal clasp. 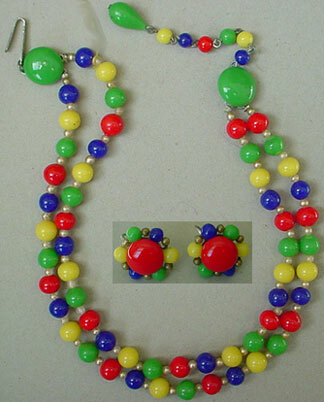 Colorful 2 strand choker with screw back earrings. Neat red seed bead necklace and clip earrings. Necklace is 18" the earrings are 1". Green seed beads with faux jade and faux pearl beads. Necklace is 17"
clear tube beads, a silver medal medallion hangs from the 22"necklace. 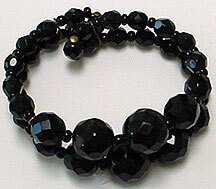 Very nice 10mm bead 7.5" long bracelet. 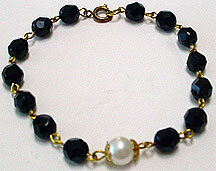 Real 8mm pearl bracelet accented with black beads, 7" long. Very nice. 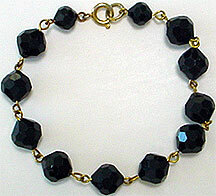 Very nice vintage black bead coil bracelet. Nice vintage wire 8" bracelet. 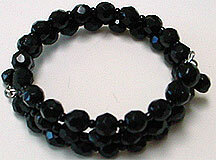 Beautiful 8mm beads on coil bracelet.